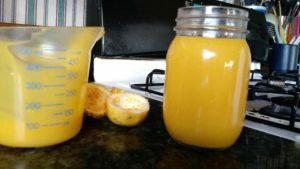 When I first got here and was in awe at the amount of passion flower fruit we can produce here in Hawaii, everyone started talking to me about lilikoi butter. It took me a while to figure it all out! 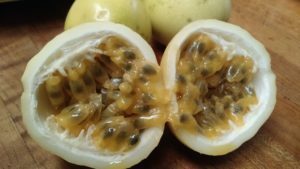 Passion flower fruit is called lilikoi in Hawaii, and what they are calling butter is what most people call curd — a fruit spread made with eggs and butter. So the first time I played with the juice from lilikoi, I made a very light mousse, which let the flavor really shine. But this time, I wanted to tackle the “butter”, and it’s really just a typical curd, but with the heavenly flavor and aroma of passion fruit. What’s not to love? Melt the butter and let cool a bit. Mix the sugar, eggs and juice together, drizzle into the slightly cooled butter. Cook on low, stirring constantly, until thickened. A couple of things to know. Heating up the pulp from the fruit lets the juice flow a little faster. Some people whir it in the blender, seeds and all, but I didn’t like the flavor or the texture that way. The wrinklier the fruit, the more pronounced the flavor. Use duck eggs if you can get them — they are mostly yolks already, and make this very rich curd all the better. Now the fun part — how to use it! Common here in Hawaii is to put it on top of pancakes, or as a filling in a donut. I may just have to try both of them, if I can stop eating it with a spoon. Hi Lisa! We had some good lilikoi butter at breakfast over in Volcano just before we saw you and Lili at the farm in November. So afterwards we were on the hunt for it! We later bought some at a coffee shop in Kona, and we’re still enjoying it – it’s great! It’s was fun to see your recipe. Hope you all (including your little doggies) and doing well.